Last November, AEGEE-Heraklio found a very original way to implement the Action Agenda by organizing and event about Greek Sign Language, aimed at spreading awareness of the human rights situation of deaf people. Because of the originality of the event and its contribution to human rights, AEGEE-Heraklio is the first local to be honored with the Most ACTive Local of the Month award. We spoke to the current President, Antonis Triantafyllakis, to find out more about their event and the importance of these types of events for human rights. ACT: First of all, which activity related to the Action Agenda did you organize? 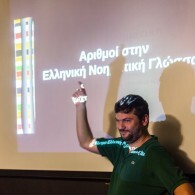 Antonis: With Giorgos Avramidis as main organizer, an event on Greek Sign Language (GSL), on the International Day of Persons with Disabilities, informing the participants on the situation around human rights of the deaf in Greek society and also training them on the basics of GSL. It was an AEGEE event, so first of all AEGEE was explained through a presentation. We talked about the history, goals and structure of our organization. We also explained what the working groups are and how the event connected to the Human Rights and Language Working Group. After that, the manager of the Center of Greek Sign Language (our partner for the event) talked about the cultural differences between Greeks and deaf Greeks and, yes, there are a lot of them, but also about the things we have in common. We use more sign language when we talk than we think we do – just think about how babies communicate! The second part of the event was about laws and human rights and the lack thereof in Greece and how that makes the daily routines of the deaf more difficult than for most of us. Furthermore, in many cases it is even dangerous for their lives. For example, a lot of deaf people have died because they couldn’t call the police or hospital for help! 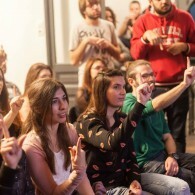 The last part of our event was an experiential workshop on Greek Sign Language. In this workshop, participants had the chance to learn the basic rules that everyone needs in order to communicate in this language. Afterwards, they learnt the alphabet, some basic words and numbers and they tried to communicate using them! What’s even more interesting here, is the fact that the modern methodology that has been developed in order to learn Sign Language worldwide nowadays happens to be based on the same principles as Non-Formal Education (NFE), which is the methodology we’re following and promoting in AEGEE trainings and events as well! The event is related to the fourth Focus Area of the Action Agenda, Civic Education, because it increased the competences of the participants (both AEGEE members and future AEGEE members) in a neglected area of human rights and culture, as well as in the NFE methodology used in the event, increasing the recognition of both in a society that could use more of both. Why did you decide to organize this activity and why did you pick this topic? 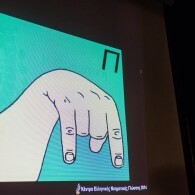 This event came up after speculation of some members that had an interest in Greek Sign Language and deaf people’s rights. So, the event was based on the fact that the deaf community has a tremendous lack of basic human rights in Greece. Also, next year is very important for them, if national elections don’t take place in the country (it was announced that there will be national elections held in January after the interview took place, ed. ), because every ten years the constitution changes/gets updated, so if we want to help them, this is exactly the right time. What were the results of your activity? 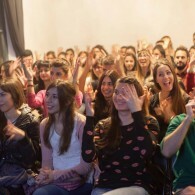 The duration of the event was more or less four hours and it took place in a small theater in the city center, part of a collaborative art cafe – social enterprise, and about 55 participants attended. Participants had to fill in an online form to attend and unfortunately we had to reject a lot of applicants due to space limitations of the venue. After the event was over, we gave them evaluation forms and the results showed clearly that there’s a big interest in Sign Language, which happily surprised us and increased our motivation to deal more with the topic. Our antenna already has big plans for Sign Language and the recognition of deaf people’s rights from the government, so a lot of people could participate in that on the local or European level. The evaluation form provided interesting conclusions, like the fact that participants, even those with little or no knowledge before the event, now have a better understanding of deaf people’s rights, are willing to learn the language and have a good idea of what AEGEE is and does. The majority of them thought the choice of the speaker and his non-formal, interactive training method were the best part of the event, and the participants actually wanted more time for the event, which makes us believe they really liked the process and its outcome. Last but not least, we expanded our mailing list with people who want to learn more about our ACTions! How do you inform your members about the Action Agenda and the Strategic Plan? Well, for starters, we’re beginning to mention it and make sure our members have at least heard of it. We’re planning an LTC at the end of January, where we’ll extensively explain all about it and have our new members brainstorm on activities they’d be interested to organize that are related to the Action Agenda and Strategic Plan! Do you have any other activities related to the Action Agenda or the Strategic Plan Planned? As we do every year since 2011, we’ll organize a Summer University this year as well, which is related to Youth Mobility. In October we organized the first MEU (Model of European Union, ed.) in Greece (following a Y Vote event in May) and we loved the experience, so for sure a similar project related to both Civic Education and Spreading Europtimism will take place in 2015 as well. We’re also planning a huge international collaboration regarding Youth Employment, but that can only happen if our related Erasmus+ KA2 application gets approved, so no spoilers till then. Apart from these big ones, a lot more smaller events will take place, depending on our new members’ interests and we’ll make sure they reflect the Action Agenda. 2015 will for sure be our most ACTive year ever in AEGEE-Heraklio! Why should other locals organize activities related to the Action Agenda? Because it is clearly what AEGEE wants to focus on! It is the whole network that approves it in the Agora and a result of our common interests anyway, so when you’re organizing activities related to the Action Agenda as a local, you’re reflecting the will of the network, realizing its aims and contributing to the future that AEGEE wants for Europe, proving that it’s not just words, but actions that shape it and we can do this together. Do you have any tips for organizing thematic activities? The most important thing is to base your activities on the interests of your members. We are all volunteers after all, so keeping our intrinsic motivation high is essential for a local to keep developing successfully. Can you tell us a bit more about your local? What makes your local so special? AEGEE-Heraklio is a fairly young local. It was found in 2005 but was not active at all till 2010, when it was reanimated by new members and started being active by organizing a SU every year. It was always a small local when it comes to the number of members and it still is, but since last year most of our members are new because almost all older members went overseas or back to their hometowns. So, 2014 marked a change in our antenna, where we started doing a lot more than just a SU every year. The best part is that we’re growing with motivated and active members who want to do great things and believe in teamwork! You can find a short video of the event here. ← The Action Agenda, the ACT and the new Active Local of the Month award!